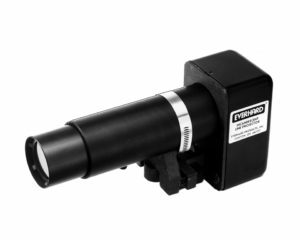 Everhard’s incandescent line projector creates a thin, sharp, uniform line of white light on a still or moving surface. Accuracy — The 1/16″ (1.59 mm) wide line is fine, sharp, and easy to see. Projecting a sharp, bright line helps to ensures proper material alignment. Easy to Use — Compact size combined with simple mounting and adjustment make incandescent projectors ideal for tread centering, sidewall alignment, and tire ply alignment. Cycle Capacity — Incandescent projector can be turned “on” and “off” to conserve life of projector lamp (sold separately). IMPORTANT NOTE: The ML09020 projector lamp is sold separately from the line projector. The ML09020 projector lamp is a direct replacement for the Fairway #68 projector lamp. Call 1-800-298-2832 for more information or to order. NOTE: Users should review the Installation/Operation Instructions and the Safety Information, both packaged with the product, before using the incandescent line projector.